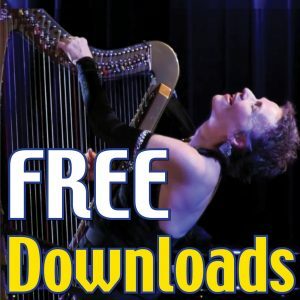 10 Reasons Hip Harp Toolkit ROCKS!!! “Hip Harp Toolkit” is my Fall online course for harp players that teaches the incredibly fun game of creating improvising arrangements! It’s the foundation of all my other courses! Below are just 10 of the reasons this course ROCKS! YOU GET MY SECRET FORMULA! It’s the formula at the HEART of most of the music we hear from jazz to classical! You’ve heard it thousands of times – but it’s a secret because it gets so altered and embellished that you don’t hear its basic structure. So I’ve distilled it (Mwaaaa-haha!!) it into a BASIC 5-Part Formula that YOU can use over and over and over – to turn any simple melody into a improvised arrangement of any length and any complexity! YOU LEARN THE JOY of the GAME INSIDE THE MUSIC! Most musicians are stuck playing what’s written on the printed page, because they don’t know how music works as a game. But once you learn my formula, each time you play a tune, it can be completely different! Music becomes a game! An the joy come when you pay WITH music instead of having to play the music you’re handed! IT’S LIKE AN ANTI-NERVOUS PILL!! Face it, the scariest part of playing for other people is the first few seconds! So imagine what it would be like to have a wonderful, simple, INTRODUCTION that makes your audience “oooo and ah” and gives you time to get your musical bearings? It’s like taking an anti-nervous pill! IT SOOOOO MUCH FUN! Did I mention It’s really, really FUN — because you get to just let go of worrying about the notes you’re playing and truly just play WITH the music! YOU PLAY TO YOUR STRENGTHS! Because we use a formula, it can be applied to any simple tune, at any level (have I said that enough?). That means that instead of YOU trying to fit yourself into a written arrangement, you can build an improvised arrangement to take advantage of YOUR strengths – whatever they are. YOU GET PERSONALIZED – and highly POSITIVE – FEEDBACK FROM A MASTER TEACHER. Many students say that watching the feedback is one of the most valuable parts of the course and the most confidence-building. And that’s not just mindless cheerleader. The kind of feedback I give you is the same kind I use with my professional-level colleagues to develop new material. (And, don’t worry – it’s optional – you’re also welcome to take the course without ever sharing your work – and that’s fine, too) With my own colleagues, we learned that ‘critiques’ are counterproductive – so my feedback always starts with what IS working because that’s the hardest thing for people to see in their own work! YOU CAN ASK ME ANYTHING! You have three different ways to get my personal coaching: The live chats, the Facebook Group and the “Ask a Question” Form. And, yes — you can ask me ANYTHING. Now … will I answer absolutely anything? Well, so far I haven’t gotten many questions I didn’t answer! YOUR ARRANGEMENTS GROW WITH YOU! Imagine playing a tune you love, getting it in your fingers, hearing people hum along … and then hearing it DEVELOP as YOU develop over the years! Imagine hearing it change and grow as your skills grow. Imagine that it gets easier when you’re tired and it gets flashier when you want to impress people. THAT’S EXACTLY WHAT HAPPENS when you learn to create spontaneous arrangements because they change as YOU change! YOU GET TO PLAY LIKE YOU!! Forget “Beginner” “Intermediate” and “Advanced” – the truth is that each person plays at their own personal level, with their own strengths and their own challenges. So I help you tailor the material to YOUR technical level whether you’re a professional who wants to create a flashy set of musical variations, to a fledgling who wants to be able to sit down and have FUN! WAIT! THERE’S ONE MORE IMPORTANT ONE!!! WE GET TO DO THIS TOGETHER! Sure, you could take all the videos, handouts and audio files from this course and work on them on your own and you’d be getting soooooo much that way – BUT I’ll be WITH you each week, answering your questions through the Facebook Group, the “Ask a Question” form and the weekly chats, giving you personalize feedback and totally LOVING having this adventure with you! !